Feed your Garfield need with a daily dose of the classic comic! The Garfield Daily Comic iPhone app allows you to view every Garfield daily comic strip ever produced - that's over 11,600 strips! This awesome app has tons of features that allow you to search and share your favorite comic strips. You can browse through the comic strips by touching the Previous or Next navigation buttons, by touching either side of the comic strip, or by swiping horizontally across the comic strip. Resize the comic strip by tapping or pinching. So simple even Odie can do it! Like Garfield, this app is prone to nap attacks. After about 10 seconds of inactivity, the navigation, status, and toolbar will fade away. To bring them back, touch the middle of the comic strip. Touch again to have them disappear. Don't worry - you can still change comics by touching or swiping. Have a special day in mind? Select any date since the beginning of the comic strip and then touch Show Comic to see that day's comic strip. Easy-peasy-lemon-squeezy! Looking for a specific theme - like lasagna, lazy or lederhosen? Search strips by typing a keyword or theme and touching the Done button on the keyboard. Then you can navigate through that list of strips. Do you like surprises? Touch the Random button to see any strip selected by Odie. You never know what treasure awaits you (please be aware of probable drool). Wanna post a strip for all your Facebook friends to see? First you need to login to Facebook. Then, simply post the selected comic strip on your Facebook wall along with a typically brilliant comment. Wanna share a strip with your BFF? Email the selected comic and add a comment. You can also go to the Settings Page to activate your preference to put a copy of the comic strip into your Saved Photos folder on your iPhone when you email the strip. Can't get enough Garfield? On the Information page there is a More Garfield button which brings you to Garfield's website with lots of links and awesome info about the famous fat cat. So what are you waiting for? 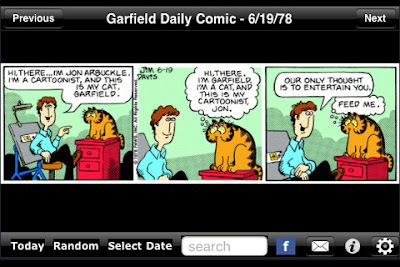 Get your paws on the Garfield Daily Comic iPhone App!